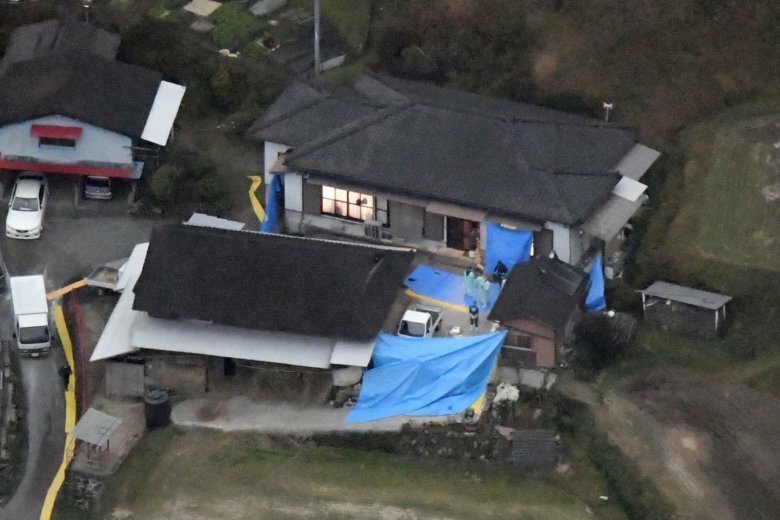 TOKYO (AP) — Japanese police investigated on Tuesday a suspected mass murder in a remote mountain village after six bodies — five people from one family and an acquaintance — were found at a farmhouse. A sixth family member apparently jumped or fell from a nearby bridge and was found hours later. Police said they are investigating if the killings resulted from a family dispute. Miyazaki prefectural police said officers found the bodies Monday after a relative of the family contacted them, saying his calls had gone unanswered. The bodies were lying in pools of blood at multiple locations in the house. Police found a blood-stained machete that they believe was used in the killings, Kyodo News agency reported. The 7-year-old granddaughter of the farmhouse’s owner, Yasuo Iihoshi, his wife Mihoko and their son’s acquaintance, Fumiaki Matsuoka, also a farmer, were among those killed, police said. Matsuoka was at the house to mediate a dispute between the son and his wife, according to Japanese media reports. The body found near the bridge was Iihoshi’s son, Masahiro, who apparently fled in the family’s car. Police are investigating whether he killed himself. The murder in the quiet hamlet raised alarm and town officials were urging residents to use caution and pick up their children after school instead of letting them walk home. The town is near the Takachiho valley, a popular tourist destination in southern Japan known for its scenic rice terraces.